Humans and canines have been hunting alongside each other ever since the domestication of the dogs began, before the age of agriculture, when hunting was the main source of food and survival. Today, there are hundreds of hunting dog breeds which today when hunting is more of a sport are referred to as sporting dogs and as hound dogs. There are many dog breeds which have been hunting together with humans for ages, while some newer hunting dog breeds have been developed specifically for a certain type of prey or hunting task. Read along to find out the basics about the top 15 best hunting dog breeds. As the name of this hunting breed suggests, American Foxhounds were specifically developed to hunt foxes. Although they resemble Beagles, American Foxhounds are actually leaner and taller and reach an average weight of 45 to 75 lbs. These hard-working and athletic hunting dogs require little grooming and maintenance, and are not only excellent hunting dogs for medium and large game but are also loving and affectionate companions and family pets. They get along with adults and children and have easy going characters which makes living with them a pleasure. Being highly capable scent hounds, they are superb and highly determined fox and deer hunters. Just make sure there are no regulations restricting the use of these dogs in your area. The cute and loveable Beagle is yet another scent hound which actually has an amazing nose, and is highly capable of hunting rabbits, foxes, birds, small deer, and other small game. They have similar coloring to the American Foxhounds but are stouter and shorter dogs which weigh about 20 to 25 lbs. The Beagles are the most popular hound dogs in the US due to their natural intelligence, the fact that they are relatively easy to train, and also because they are perfect household pets for all kinds of families and owners. The Bloodhound is the hunting dog breed with the best nose among all canines. Bloodhounds are unmatched when it comes to tracking scents, which is why they are not only perfect hunters but also are used for search and rescue operations for missing people. Their specialty is tracking down large game but can be used for all kinds of hunting. Bloodhounds weigh about 80 to 110 lbs. and are very easy going and docile animals which makes them perfect for companions and family pets as well. The fact is that all Spaniels are great hunting breeds, but the Boykin is one of the best of them all. If you are looking for the perfect hunting dog breed for birds, the Boykin Terrier could be the best option for you. These active dogs are superb when it comes to flushing as well as retrieving. The dogs from this hunting breed are very easy to train and have an endless determination to hunt. Their coats make them suitable for hunting in wetlands and heavy brush areas, which is great news for all of you looking for a dog for duck or other waterfowl hunting. The Boykin will usually weigh about 25 to 40 lbs. and has a life expectancy of 14 to 16 years. The Boykin Spaniel is not only an excellent hunting dog, but it is a great companion as well. The dogs from this breed are easy going and loving and will get along with all members of your family. Their coats do require more grooming and maintenance than many of the other hunting dog breeds, but nevertheless, the Boykin Spaniels are excellent and exuberant hunters, loving pets and very handsome looking canines. Many people mistakenly believe that Brittanys are Spaniels, but actually, they are closer to the Setters. Being somewhere in between the Spaniel and Setter hunting breeds, the Brittany dogs are very versatile bird hunting dogs. They can flush, point, retrieve as well as take part in agility contests. These medium-sized hunting dogs are also very beautiful looking and require a little maintenance and grooming. They have a life expectancy of 14 to 15 years and an average weight of 30 to 40 lbs. The dogs from this breed have incredibly high energy levels, so make sure that you will provide your Brittany with the hunting and the daily exercise it needs in order for it to stay content and out of trouble. This is a breed which originated in the US, and the dogs from this great hunting breed are amazingly athletic and especially good at hunting in wet regions which makes them a superb choice if you want a dog to help you with your duck or other waterfowl hunting. The Chesapeake Bay Retriever weighs about 55 to 80 lbs. and has a waterproof coat which will keep it safe and will not slow it down when retrieving duck, geese or other birds from the wetlands. Similarly to all other retriever dogs, the Chesapeake Bay Retrievers are also excellent companions and family dogs as well. The Coonhound is another excellent hunting dog for small and medium-sized game. There are several types of Coonhounds, including the Teeing Walker, the Bluetick, the American English, the Redbone, and the Black and Tan Coonhounds but every single one of them is a superb choice when it comes to picking the best hunting dog breeds. The Treeing Walker is an especially capable hunter thanks to its natural intelligence, inborn tenancy, and endless determination. Nothing will stop this dog when it is chasing an animal, and it is a very tough canine which requires little maintenance and can withstand running through bramble and other tough areas. The Treeing Walker resembles the American Foxhound and the Beagle and it is more of the size of the former. The dogs from this breed have an average weight of about 50 to 70 lbs. Overall the Coonhound has an inexhaustible stamina level, which is exactly what you should be looking for if you want a hunting dog which will be by your side and will work restlessly all day long. The graceful English Setter is most definitely among the most beautiful hunting dog breeds with its long and luxurious coat. This fact though is the only setback for using the English Setter for hunting, as the fur can easily get tangled and messy once you go outside to hunt. On the other hand, the English Setter dogs are amazing bird hunting dogs. They can cope with uneven and rough terrains without any problems and are incredibly intelligent and obedient canines. At home, they are incredibly devoted and loving pets which though do like getting into mischief from time to time. The English Setter is a gorgeous medium-size hunting dog which will reach a weight of 45-80 lbs. and will become an irreplaceable partner when you go bird hunting. So, if you don’t mind the extra grooming which this dog breed requires, this is the perfect hunting partner and family companion you can get. The English Springer Spaniel is a beautiful gun dog breed, and one of the finest hunters among all Spaniels. A typical male dog from this hunting breed will weigh about 40 to 60 lbs., and the females are 35 to 55 lbs. The dogs from this medium sized hunting breed were bred and used for flushing as well as for retrieving game. They are eager to please, easy to train and have a natural willingness to obey their humans, so you will not have problems teaching your dog to hunt as well as training it to become a family pet as well. Many English Springer Spaniel owners prefer to proudly present their beloved four-legged friends at dog shows instead of using them for hunting, but in fact, you can do both with this versatile and active dog! 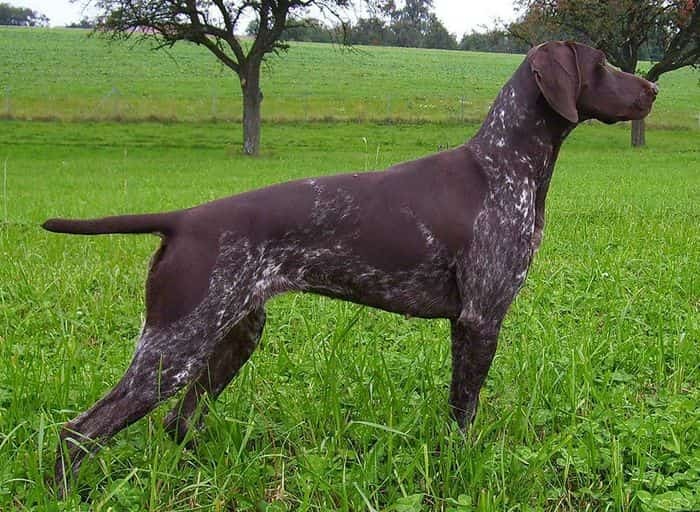 The German Shorthaired Pointer is the epitome of the bird hunting pointing dog. These elegant and agile canines are intelligent, smart and determined which are all essential features of the best hunting dog breeds. One potential downside of the German Shorthaired Pointer breed is their endless energy, which requires everyday extensive exercise and stimulation. This is a positive feature if you are planning on taking your dog to long hunting trips often, but if you are expecting more of a couch potato pup, this breed is definitely not for you. The dogs from this medium-sized breed reach a weight of 45 to 70 lbs. and are the perfect companions and pets for people who love being active and the outdoors. Your German Shorthaired Pointer will happily join you when you go hiking, running, swimming or otherwise spending time outside. The Golden Retriever has long held one of the top 3 positions for the most popular dog breed in the US, and there are various reasons for that. They are excellent family dogs which are great with children and adults alike and are gentle, obedient and loving pups. At the same time, Golden Retrievers are also exceptional hunting dogs. Thanks to their beautiful long hair on their chests, bellies, and legs, these dogs are perfectly suited for running through the brush to retrieve the prey. Goldens have very happy dispositions, and also high stamina levels, which make them perfect for bird hunting companions, as well as for running or play buddies for the young and old. Just like their English cousins, the Irish Setters are gorgeous looking athletic bird hunting dogs with luxurious long fiery red coats, which do require more grooming and brushing than many of the other hunting dog breeds. Yet, if regular grooming doesn’t bother you, you can be pretty sure that you will be getting one of the best bird hunting dogs if you add an Irish Setter to your family. These canines are exceptional fetchers, and will always find and return whatever you throw for them, as well as every single quarry you have hit. While they are smart and determined dogs, the Irish Setters are known to be a tad boisterous as well, so you may have some problems then training them as young. This is why it is essential to be determined and to stay positive when you are training your dog from this breed if you want an obedient and efficient hunting dog and a loving and loyal companion or pet. These small sized fun dogs are not only clownish little pups. The fact is that the Jack Russell Terriers are incredibly fast and efficient flushers of small game, and especially rabbits and hare. These small dogs reach a weight of only 10 to 20 lbs. but have endless energy supplies, and do need a lot of stimulation and exercise on a daily basis, which can be problematic when you are back home and don’t have the time or energy to keep them active and mentally entertained. They are loving and smart little dogs, but like most other terriers are not the easiest breed to train, especially if you are a newbie dog owner. Otherwise, for flushing and for hunting down small prey, there is hardly a better hunting dog breed out there than the Jack Russel Terrier. The Labrador Retriever has been America’s number one favorite dog breed for over 20 years now, and there are many good reasons for this. These beautiful medium sized dogs are exceptionally loyal and loving companions and will stick by their owners no matter what. Also, Labrador Retrievers are superb retrievers as their name suggests. They are excellent hunting dogs for birds and will fetch kills no matter the terrain or the weather. They grow to weigh about 55 to 80 lbs. and can be golden, black or chocolate colored. Thankfully for the owners, their coat does not require too much grooming. As a matter of fact, no matter how hard we think, we cannot find a downside of this amazingly popular hunting dog breed. With a stunningly gorgeous appearance, these dogs are also known as the Grey ghosts and can often be seen playing and goofing around with their humans or with other dogs. But keep in mind that these incredibly beautiful canines were originally bred to be hunting dogs. The athletic, fast and smart dogs from this German breed have all the physical and mental qualities to be exceptional hunting dogs, but definitely, need serious training as well as daily intensive exercise in order to stay happy and in great form. At home, these grey aristocratic dogs bond well with both adults and kids but will be happy and will act normal if you provide them with the exercise they need to stay healthy and happy. There are many dog breeds which can be considered as hunting dogs, many of which have been alongside people for years, while as others have been specifically bred for certain types of hunting. There are two main types of hunting dog breeds – gun dogs and hounds. Of course, there are many sub-categories as well. Hounds are hunting dogs which are capable of tracking, chasing and killing the prey by themselves, and some breeds are used for that, while others are only used for tracking the prey. Hounds are Sighthounds, Scent hounds or Lurchers. The Sighthounds rely on their eyesight to locate the prey, while Scent hounds use their noses to do so. Sighthounds are more slender and elegant and agile breeds like Wolfhounds, Greyhounds, Scottish Deerhounds, Afghan hounds, and others. The Scent hounds rely on their advanced sense of smell to find the prey, so they are not as athletic or fast as the Sight Hounds. Some of the most popular scent hounds include the Bloodhounds, Basset Hounds, Beagles, Dachshunds, and Foxhounds. The role of the gun dogs is to assist the hunters and have been bred to work along firearms. Many of the hunting dog breeds of this type are relatively new. Gun dogs love participating in hunting but do not hunt alone. Rather, they will retrieve quarry, flush birds from hiding, or track and chase the pray towards the hunters. Some popular categories of gun dogs include the Retrievers, Setters, Pointers, Spaniels, HPRs (hunt, point, retrieve), Waterdogs, Dachshunds, Curs, Feists, and Terriers. Some of the hunting dog breeds are not firmly set in just one of the types or subcategories, and there is an ongoing debate about their position. There are some hunting dog breeds which are better for specific hunting applications and types of prey. The Bird hunters are great for flushing out hidden birds and retrieving the prey. Some of the best bird hunting breeds include the Retrievers, Setters, Spaniels, and Pointers. There are different breeds which are specialized in the hunting of different types of birds. The Rabbit hunting dogs include Scent hounds which can track down the small prey and flush it out from hiding. Some of the best rabbit hunting breeds include the Beagles, Dachshunds, Basset hounds, Weimaraners, and Terriers. The deer hunting dog breeds typically have both sufficient stamina as well as good noses to be able to track and follow the fast deer which can run for miles. One of the best deer hunting dogs in the US is the American Foxhound. Large game dog hunting breeds are developed for hunting large animals such as bears, boar, mountain lions, and others. These are typically large and strong dogs, such as the Coonhound, the American Pitbull Terrier, the Plott hound, and others. Any hunter will agree that a good hunting dog is one of the most essential requirements for successful hunting. We have picked the top best hunting dog breeds for you, so hopefully, you have managed to choose the best dog to take hunting with you and then to go home with.